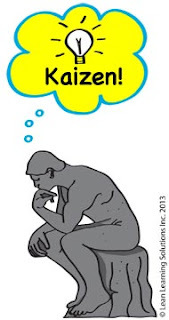 Lean Thinking: Reprise: What is a Key Thinker? Reprise: What is a Key Thinker? Deployment leader, Pacemaker, Key Thinking Guy/Gal, Chief Engineer -- these are all synonyms for this critical role. As a chemical engineer, I see the role as akin to an enzyme in a chemical reaction. Some reactions are glacial & take forever to come to completion. But once you add the enzyme -- whoosh! These are leaders who 'wrap their arms around the critical breakthrough zones' -- like Safety or Quality or Cost. They go see, reflect, talk to people at all levels, and thereby grasp the situation. As a result, our Key Thinker is able to formulate a hypothesis: "If we do A, B and C, then X will happen!" Testable hypotheses gives us insight about the Black Box known as our business. Keep doing it, and pretty soon (say, 3 or 4 years) you have profound knowledge. That's what profound knowledge looks like: stories, examples, nuance, finesse. The best known example is, perhaps, Toyota's famous 'Heavyweight Chief Engineer'. Famously, Chief Engineers have few direct reports, but are the most powerful person in the value stream (or, in the auto industry, Platform). Passionate about their zone, impatient with the status quo, ornery, yet able, at the end of the day, to forge a consensus. They're a critical enabler in any transformation, our conscience, and the eyes and ears of the CEO. "How will we develop more Key Thinkers?" Moreover, the CEO and COO need to ask, "How will we support out Key Thinkers?" Here's an example. Imagine you are senior leaders in a major hospital system. Your over-riding objective is "No Infections!" How would we start? Perhaps we can agree that a committee won't do. We'd need to start with a person with the qualities described above -- in other words, with a Key Thinker. If we lacked such people, we’d have to develop them, and we’d have to think deeply about how we, as senior leaders, would support them.